Leader Doors has become one of the UK’s largest online door retailers, with over 10 million visitors to its website annually. Run from an office in Hartlepool, it offers an unparalleled shopping experience hinging on a huge amount of choice, low prices and great customer service. Its products are offered at up to 50% off RRP on a site that’s easy to navigate with plenty of information and help if you need it. Its Help & Advice centre has everything from size and measuring guides to door stripping and door insulation tips. There’s a whole world of doors out there and Leader opens you up to it all: internal, external, patio and louvre; this is a brand with a handle on all your door-related needs. There are plenty of accessories too to ensure you can install and secure your new purchases with ease. It’s also got a blog with the latest news and innovations on style and security. How do I use my Leader Doors discount code? Sign up to Leader Doors’ mailing list to hear about some special offers! 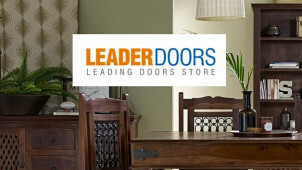 Can I get free delivery with Leader Doors? Unfortunately not, however you can arrange to click & collect without charge. Is there a referral scheme at Leader Doors? Yes, if you refer a friend you will both get money off your next order. See here for details. Delivery cost depends on the nature of the product. Most services will deliver within 2-3 working days of your order, some offer next day / specific day delivery. Free click & collect service also available. You can return your purchase within 14 days of receipt to receive an exchange or refund. Item must be in original conditions and packaging. Email cancellations@leadergroup.co.uk to initiate a return. Full policy here. A door can be a real object of beauty in the home: stylish, practical and complementing your decor; it can really make your interiors stand out. Leader Doors is a specialist in this area, and use of a Leader Doors discount code from vouchercloud could make your next purchase come in for less. With a whole range of front doors, garage doors, sliding patio doors and more, there’s something here for every need. The world of doors can be quite involved, but luckily Leader Doors has a load of handy features to ensure you buy with confidence, including a vast glossary to help you sort your aperture from your architrave and your latch pack from your lipping. What’s more, if you need to consult a real human, it’s got a knowledgeable customer service team on hand as well as an excellent live chat function on the website to ensure you get your purchase right. Your patio is one of the most important places in your home, so make sure you’ve got a patio door that truly does it justice. From French Patio Doors to Folding Sliding Door Sets, there’s a style here for every taste, and using a Leader Doors voucher code from vouchercloud could leave you with a hefty saving. Open your home to your green space and you’ll create an ideal area for both entertaining and relaxing.